Help Superman save metropolis this Halloween season as his female counterpart in this children's Supergirl costume. 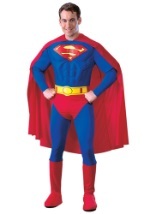 The costume includes a dress that features Superman's logo on the chest of a blue, velvet top. The top has long sleeves and matches the red, shiny skirt that is made from polyester. The same material is also used for the attached cape. The costume is accented in shiny gold including a belt that wraps around the waist. Complete the look with the red and gold boot tops and be ready to save the world.